The British is a pub on the Isle of Man that prides itself on its real ales and great food. 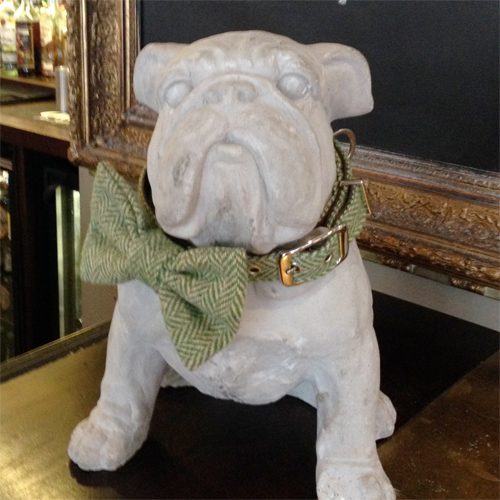 It’s also home to Bob the dog, who sits on the bar and ensures everyone has a good time. (At LMD, we don’t think a pub is a ‘proper’ pub unless it’s got a dog in it). Apparntely Bob has sported lots of different looks over the last year or so, but he’s currently looking terrific in his LMD Appleby Harris Tweed dog collar and bow wow tie. If you find yourself in Douglas any time soon, be sure to visit The British and say a big hello to Bob from us.